Shop Dry Idea AdvancedDry Antiperspirant & Deodorant Clear Gel Unscented (3 oz. )3 oz. $339$3 and 39 cents$1.13 / oz. $579$5 and 79 cents$1.78 / oz. Shop Dry Idea Advanced 24 Hr. Antiperspirant & Deodorant Clear Gel Powder Fresh (3 oz. )3 oz. A fresh, clean feeling no matter your environment is important. That's why finding a deodorant that you trust is an essential part of your daily personal care routine. 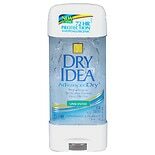 Walgreens offers a range of Dry Idea Deodorants, which can deliver around-the-clock protection from embarrassing body odor. Whether you're spending a day at the office, taking in the sunshine, or jogging on a local trail, Dry Idea Deodorant ensures you stay odor-free. When you're shopping for an odor-protection product, you might consider both antiperspirants and deodorants. These distinctly different products offer different benefits. Antiperspirants focus on wetness protection by minimizing underarm perspiration. Reducing sweat, in turn, cuts down on body odor. Deodorants, on the other hand, focus on eliminating odor, not perspiration. Thanks to Dry Idea, you don't have to choose which type of product is best for you. Dry Idea Deodorants are both antiperspirants and deodorants, making them a multi-tasking option. 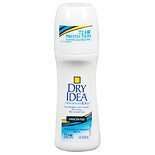 At Walgreens, you can find Dry Idea Deodorants in a variety of styles, making it simple to find the one that best works for your needs. Roll-on deodorants come in both scented, such as powder fresh, and unscented varieties. These roll-on styles are silicone based, making them supremely effective. Dry Idea Deodorants do not use water, which makes them feel dry when applied to your underarm. 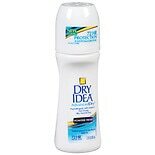 Try one of Dry Idea's three roll-on styles: its original hypo-allergenic formula; its Stain-Clear deodorant, which goes on clear to avoid stains on your clothes or skin; or its Silky Smooth deodorant, which uses vitamin E to soften and smooth your skin. 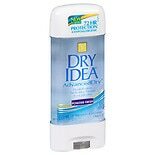 Dry Idea Deodorants are also available in gel form. These gel deodorants glide on smoothly without leaving any residue. These hypo-allergenic formulas provide 24-hour odor and wetness protection with a clear gel. Invisible solid deodorants available at Walgreens offer a number of benefits, including sweat protection, stain fighting, clear application, and 72-hour protection from odor and wetness. Finally, individuals seeking supreme odor and wetness protection can opt for a clinical-strength Dry Idea Deodorant, which uses Micro Activated Technology to offer the company's highest wetness efficacy.